Dead Horse Point is a must see when visiting the areas around Moab, UT. 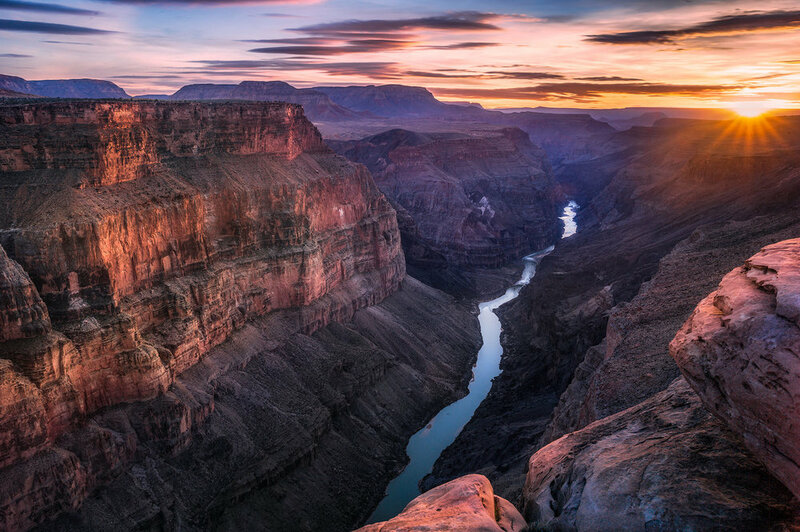 This iconic viewpoint of this surreal gooseneck in the Colorado River is something you will want to add to your checklist and portfolio. It is hard to stand on the ledge of this location without wondering how all of this happened. 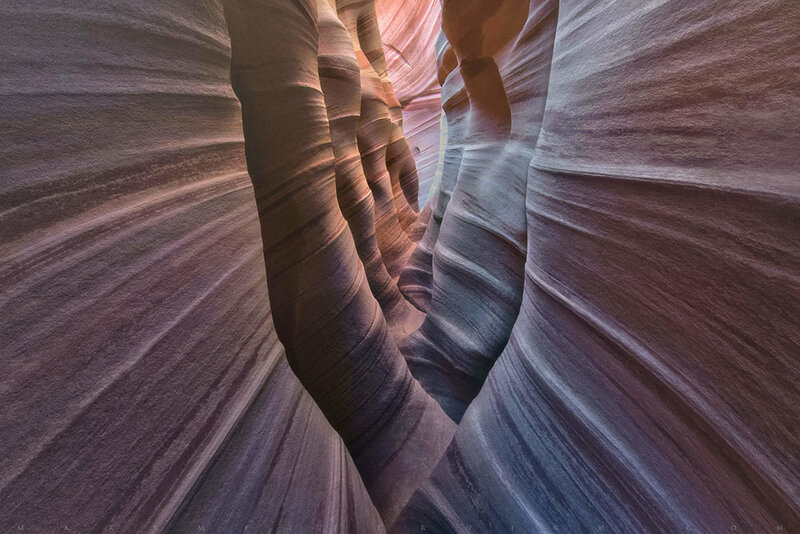 The many layers of sandstone, buttes and vertical cliffs (carved by ice, water and wind) help to create a photographic masterpiece. This is a great location to spend a day or so hiking, exploring and experiencing this magnificent place – with the added bonus at sunrise and sunset for photographing a masterpiece of your own. I would rate the difficulty of this trail as either a 1 or a 3 on a scale of 1-5 (with 5 being most difficult). The hike from the parking lot is a moderate 150yd walk (which rates as a 1). However, if you walk down to the location where this was shot from (which is below the tourist overlook) – you are right on the ledge with a 1,000ft drop. This viewpoint IS NOT FOR EVERYONE and I would rate as a 3. The closest town is Moab, UT (50 miles). The directions are from Moab, UT. 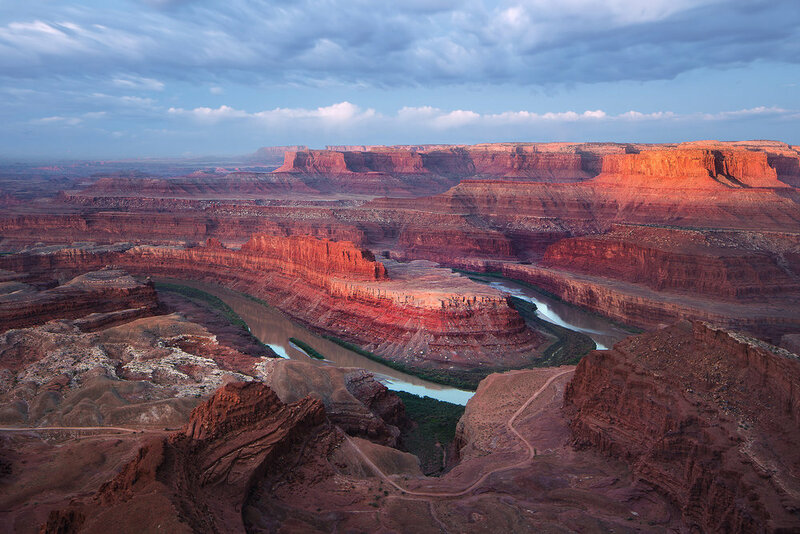 From Moab: Travel northwest on US-191for 11 miles until you reach the entrance to the Canyonlands National Park. Take a left on UT-313 and drive west and then south 14.6 miles until you see the sign for Dead Horse Point State Park. Continue for the next 8.0 miles until you reach the parking lot. From the parking lot follow the cement sidewalk to the covered visitor’s area and then turn right to the visitors overlook. The shot above was taken directly below the visitors overlook. To get to this point you need to walk down the asphalt walkway for 50 yds or so and hike down to an undeveloped trail along the ledge. The drop-off from the ledge is 1,000ft and certain death. Extreme caution is called for in this location. Even though Dead Horse Point can be photographed at either sunset or sunrise, I much prefer sunrise. However, I would suggest doing both if possible. 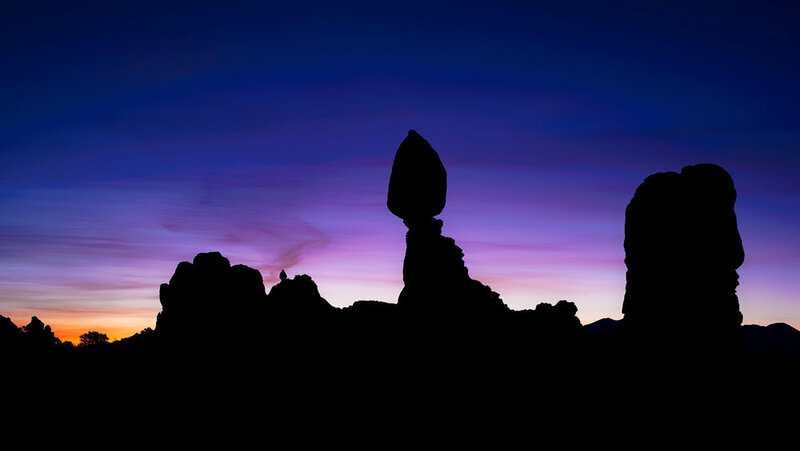 For sunset, the long shadows and glowing red rock come from the right to left. At sunrise, the sun comes from the left. The shot above was taken at sunrise. I would also suggest shooting at both 30 minutes or so before sunrise and after sunset as the light can be interesting during these periods. 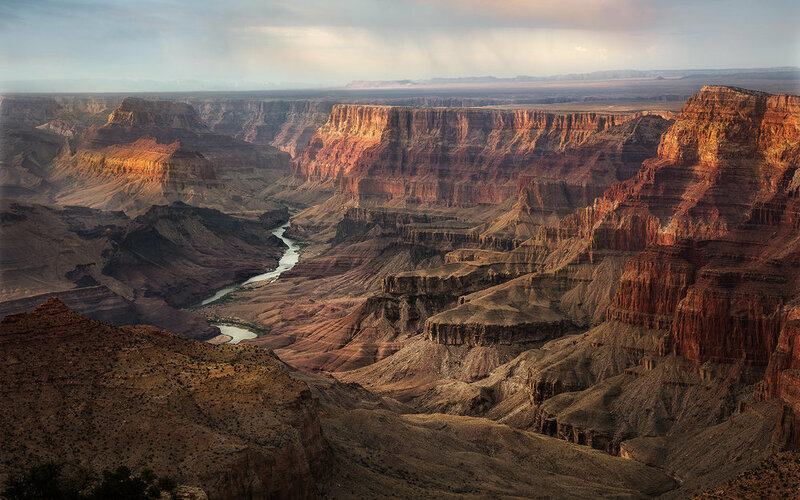 Dead Horse Point can be photographed any time of the year. However, clouds and interesting weather help to produce a better image, so I like to go during the late summer months (monsoon season) as to have a better chance for clouds and weather. This shot can work so many ways: a pano, a tight compression or a nice wide-angle vista. Bring lenses ranging from 16 – 135mm. The above shot was taken with a 24mm lens. 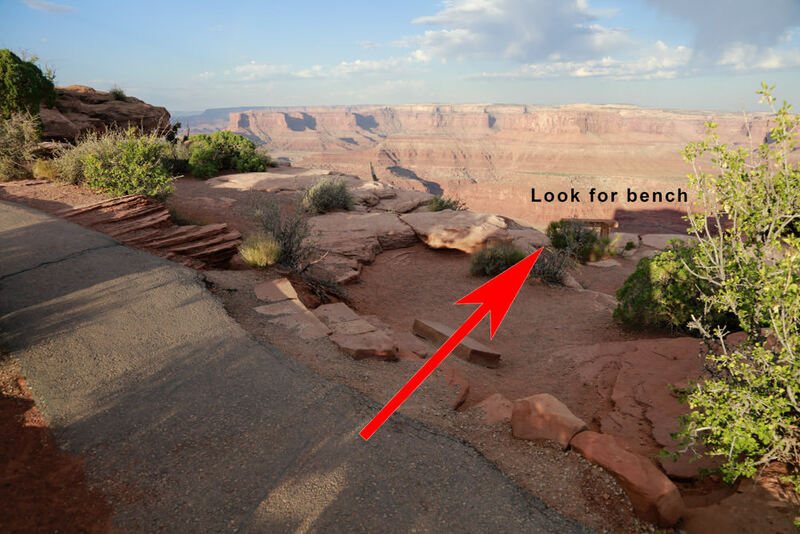 Dead Horse Point is a state park and the fee at time of this writing is $15 per vehicle up to eight passengers, valid for 3 days, $10 for seniors 62 and older, $10 per motorcycle, $2 pedestrian or cyclist (biking into park). 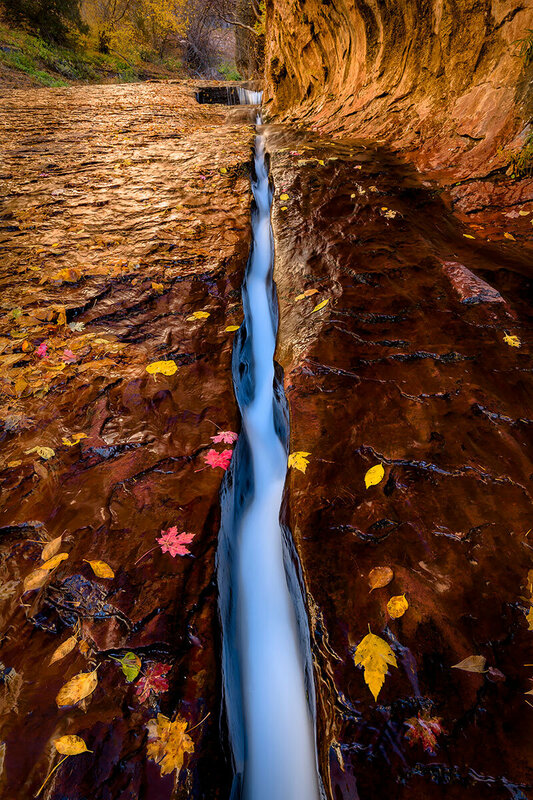 As beautiful as this location is, it can be hard to capture the essence of what you see. 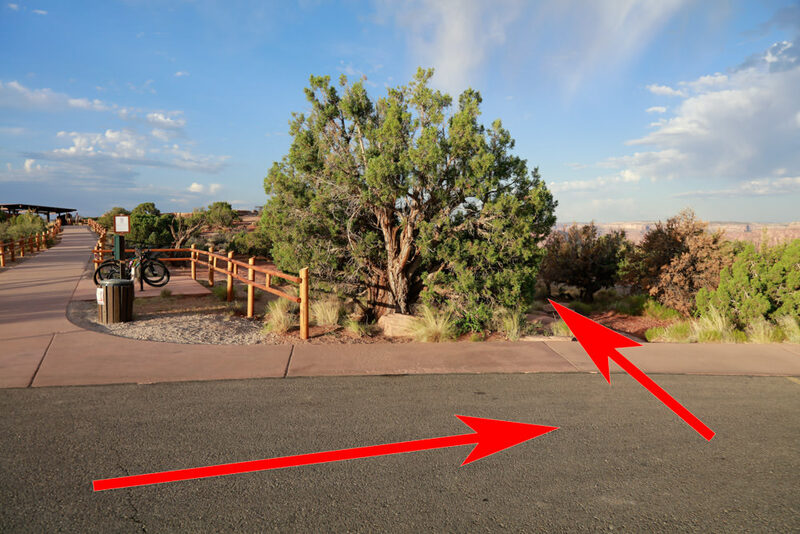 I would suggest arriving a couple of hours early and walking up and down the area around the tourist overlook/viewpoint. Most photographs I have seen try to anchor the shot with some foreground. There is a famous curved bush about 50-75 yds. along the right side of the ledge from the tourist overlook. If you are going to shoot sunrise, arrive at least 30-45 minutes before sunrise to find your spot/composition. Once the sun crest the horizon, the shot is blown out very quickly (1-5 minutes) after the sun comes up. No need for any special photography equipment (other than a sturdy tripod and a polarizer) unless you plan on doing a panoramic shot. You may also want to consider using a tilt/shift lens if you have one to compensate for the keystone effect while pointing down toward river. A headlamp or flashlight is a must if you are shooting at early morning or twilight. 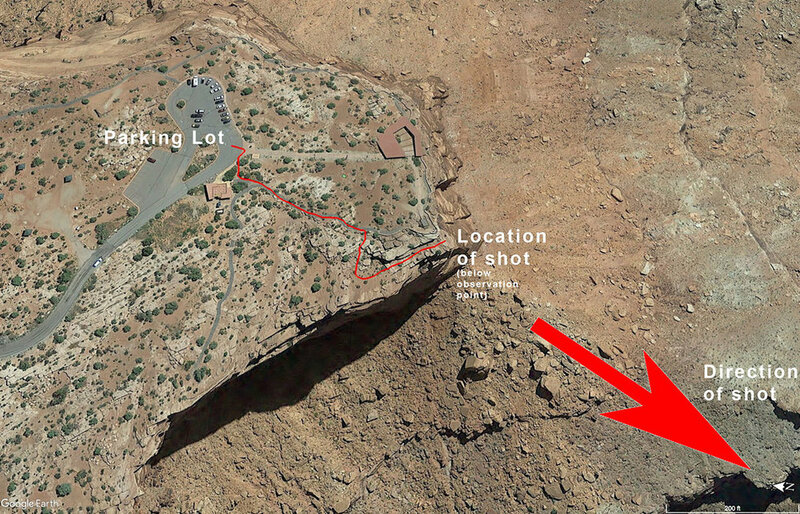 If you are shooting on the ledge, it is always important to know where you are - as a fall from here is certain death. Dead Horse Point can be very busy during the tourist season and there will most likely be many photographers along the ledge for sunset around the tourist overlook. Fewer photographers get up for sunrise, but there are only a few premium locations – so make sure you get there early to claim your place. 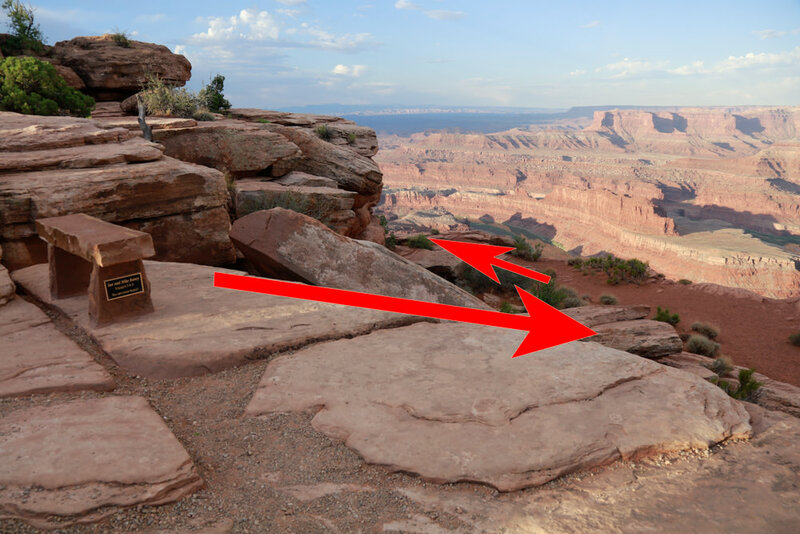 Dead Horse Point is a high desert climate where temperatures can vary up to 40° in a day. Spring and fall are nice, but summer can get into the 100s. The monsoon season (in late summer) brings violent but brief thunderstorms, which often cause flash floods. I have Verizon and there is no cell service from this location. 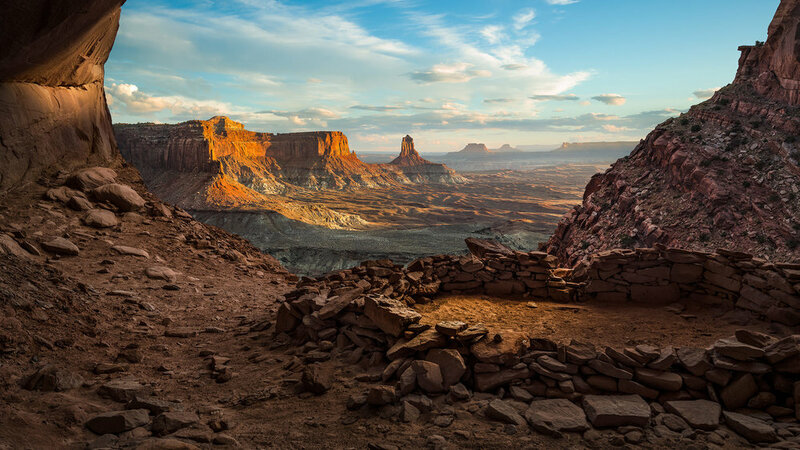 The Dead Horse State Park is about 35 miles from Moab, on the road to Canyonlands National Park. Moab is a nice town and has an abundance of lodging. 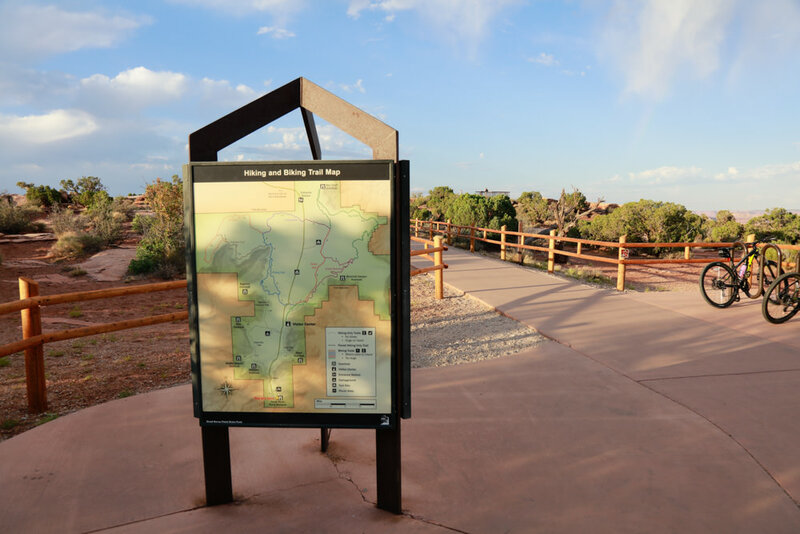 There is a nice campsite in the Dead Horse State Park and a few other campsites in and around Canyonlands National Park. The Kayenta campground has has 21 sites (17 standard partial hookups and 3 yurt). Sites are $15 per night + state park enterance fee of $20/. There are no restaurants or lodges in the Dead Horse State Park. Moab, UT, is the nearest town (35 miles) and has a nice choice of restaurants. There are several good places to eat in Moab. Eklecticafé is a nice place for breakfast and the Desert Bistro is a high-end place for dinner. The closest laundry mat is - Moab Laundry Express LLC @ West 100 North, Moab, UT. Open 24 hours and has Wifi. The closest airport is Salt Lake City International Airport (SLC), which is 230 miles west and services most of the major airlines in the US. Walker Field (GJT) in Grand Junction Colorado (110 miles north and then east), is a small regional airport and services United Express, SkyWest/Delta, and America West Express/Mesa Airlines. The Photographer's Ephemeris is a very valuable tool for landscape photographers to determine the direction of the sunrise/sunset & moonrise/moonset from any place on earth on any day (past and future). Click here to take you to The Photographer's Ephemeris for this location.